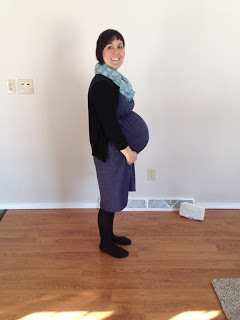 I am celebrating 38 weeks of pregnancy. I am kind of joking about celebrating…heartburn and being generally uncomfortable 24/7 is not much to celebrate, but I am very close to having a sweet new baby in the house and that is worth celebrating. We had a false alarm the other day when I was leaking two nights in a row; I was thinking that it might be my water breaking. Thankfully it wasn’t. It was enough to get me motivated to pack my birth center bags and get more prepared, just in case baby comes a little early though. Today, two more ladies I know had their babies. Once everyone else starts having their babies that have due dates near me, I get even more eager to welcome birth. I feel pretty ready. One nice thing about having babies close together is that you don’t forget all of the rigors of birth and motherhood. I have no false impressions about how hard it is going to be. Three and half years between Jane and Maurie left me forgetting what things were like. I am especially curious to see how Maurie responds to having a baby around. Jane is excited to be a sister again and has told me that she will be my big helper. She watched a great episode of Daniel Tiger where he gets a new baby sister and becomes the helper. (Have I ever said how much I love Daniel Tiger? There is a Daniel Tiger musical coming to the Performing Arts Center here in Appleton that I would love to take Jane to. It is the day after her birthday too.) Cody is ready to get things going with baby as well, but I laugh when I see him carrying Maurie and Jane around. He is going to be a very popular man. Thankfully we have a Lillebaby carrier now, so he may be able to carry all three at any given time. Ha! I also bought another infant car seat (we will have two infant car seats in the van), more nursing bras and Honest Company shampoo and body wash. Of course diapers and few other essentials are still on the list, but everything else I already have. Jane and Maurie have followed Cody and me in sickness. Yesterday I took them both to the doctor. Maurie’s oxygen levels were low and she was showing signs of difficulty breathing. Thankfully we were able to give her a nebulizer treatment and her levels went up. She has been doing a little bit better since then, even with her terrible cough and fever. Jane has fared just fine outside of a cough. I am looking forward to everyone at our house being healthy so baby can avoid unnecessary exposure to illnesses. I have done a few new things. I need to perfect the art of sharing how I do things through photos and explanation, but until I do, here are the only pictures I did take. 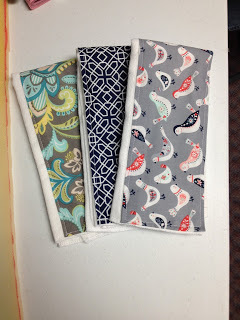 I made–and will be making more– burp rags and we also attempted making our own yogurt, with success! Super easy to make…with some help from Cody. 😉 Cody truly is better at sewing than me. 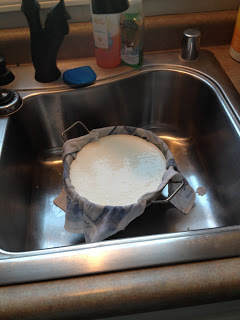 This is the yogurt draining through a cheese cloth, making it Greek yogurt. Thank you Connie for the recipe. 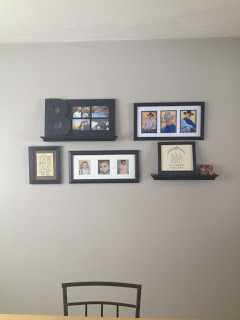 We finally hung up a few pictures in the dining room. I also painted a large mirror that we hung in the dining room and and finished painting our stairwell and touched up some other wall spaces with paint. We were terribly disappointed when we got out the paint and realized that most of it had frozen in the garage. We have transferred it to the basement since, but I am very sad if the cans of paint that were not even ever opened are ruined. Paint is too expensive! Anyways, I hope everyone is well and has something to look forward to during this winter. I have noticed that since I have lived in places that have long winters, I have to give myself something to look forward to or winter feels unbearable at time. If you live in a warm place where the sun is shining right now, enjoy it for me!